The eye shadow palette by Ben Nye is available in two different shade combinations, essential and theatrical. 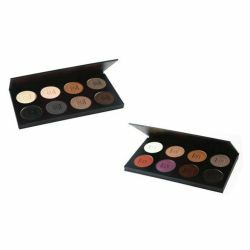 The essential palette includes the 8 most commonly sold shades for natural makeup application and includes ES-302 Vanilla, ES-314 Shell, ES-50 Cork, ES-37 Mink Stole, ES-99 Black, ES-98 Graphite, ES-36 Smokey Taupe, and ES-595 Black-Brown. The theatrical palette includes more dramatic and artistic shades and includes ES-30 White, ES-34 Taupe, ES-50 Cork, ES-35 Cobblestone, ES-72 Raisin, ES-80 Deep Violet, ES-57 Twilight Sable, and ES-99 Black. Refills are available by special order and take approximately 2 weeks. Please call our customer service department toll free at 1-877-218-1289 to order your refills.